The past week has been a strange one. Last Wednesday started with excitement when Sweetspot.ca named my blog one of its Top 10: Canadian Food Blogs. Yay! I couldn't believe it. How did they even hear about my blog? Why did they pick mine when there are so many incredible food blogs out there? I was feeling totally honoured and, well, quite satisfied with myself. Then I promptly came down with pneumonia. Yup, pneumonia. In July. Blogging got put on hold. Everything got put on hold. But a week later I'm starting to feel more like myself again. I'm not out of the woods but I'm in the pantry, and that says something about my general state of health. If I'm baking, I'm on the mend. I wanted to do something with the pretty white flesh peaches Mr. Feedbag brought home from the grocery store. It's early peach season and he loves white peaches! While this peach streusel cake is not enough to truly make up for all he's done to keep our family on track this past week, it just might be enough to say thank you. This cake could be made with any peach variety. 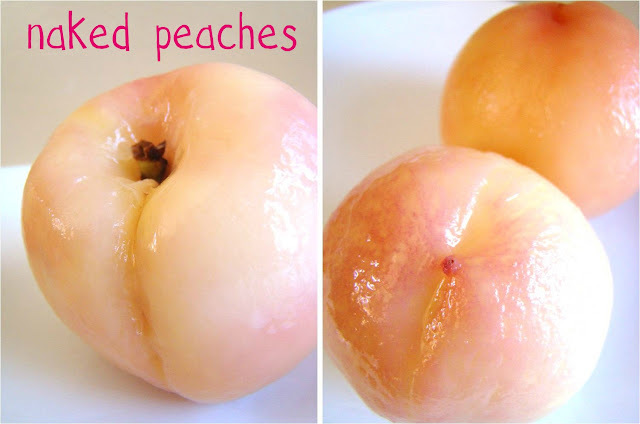 To skin a peach, simply boil whole for two or three minutes, then plunge them into ice cold water. The skins will pull right off. While the oven preheated to 375 degrees (F), I creamed the butter and the sugar using my stand mixer. I added the eggs, oil, and vanilla and beat on medium speed until well combined. In a medium mixing bowl, I combined the flour, baking powder, baking soda, and salt, and added the dry ingredients to the wet ingredients gradually, beating well on medium speed. 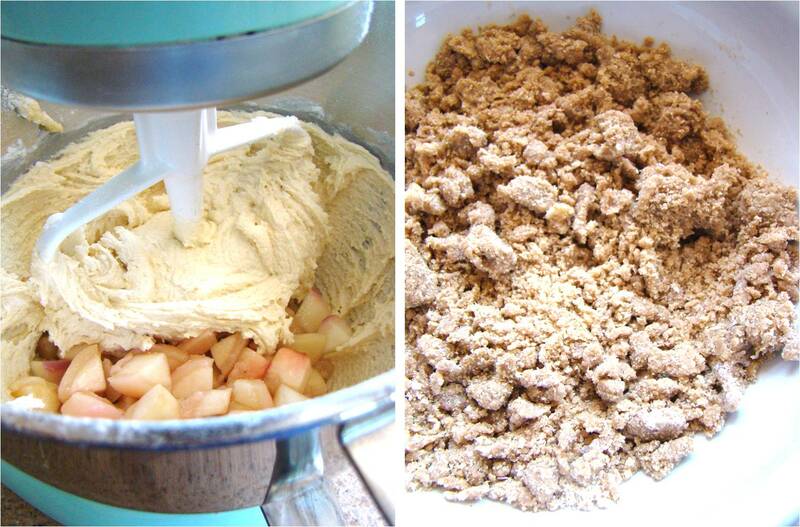 Then I stirred in the peaches to finish the batter. All four ingredients were mixed together with a fork in a small mixing bowl and sprinkled over the cake batter. I popped the cake in the oven to bake until a toothpick in the centre came out clean, which was 45 minutes in my oven. This style of cake, usually referred to as a coffee cake, is perfect for sharing with company. Not much company around these days, though. So Mr. Feedbag and I will have to nibble away at this ourselves. It's a rough life! 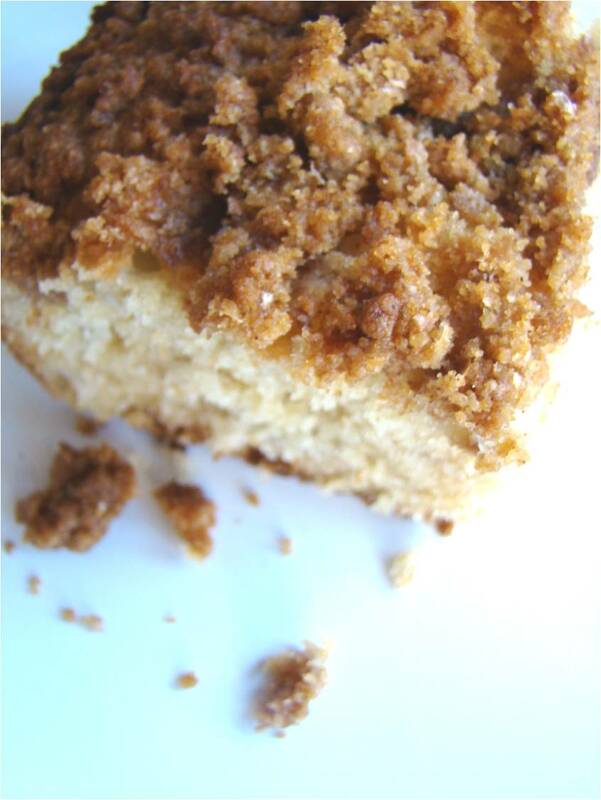 Do you make coffee cake? Which variety of peach do you prefer? Other than eating them whole, how do you like to prepare peaches? yummy!! so happy to see you back! glad you're feeling better! Mr.BM came down with bronchitis and a lung infection a few weeks ago which transfered to me so I hear ya on putting things on hold. That looks so good! It's first thing in the morning and I'm doing some catch up reading before the little one wakes up and all I keep thinking is how GOOD this would be with a cup of coffee... right NOW! :) Happy to hear you are feeling better. The weather is what's been keeping me out of the kitchen, it's (finally) too nice outside! nook. - I may be a lazy blogger for another week or so. Lazy eater = lazy cook = not much to write about! Betty Martha - Sorry to hear the sickness got you too. Get out of our houses, sickness!! You hear me?! Mmm - It WOULD be good right now. And right now. And now too. Enjoy that summer weather, at long last! Congrats on the Top 10 list! How exciting..I love your recipes and images, now if only I could cook. Congrats on making top 10 food blogs, Amy!